It makes sense that increased advertising exposure can have positive benefits for public awareness and generation of business or patronage. After all, it is hard to succeed if you don’t get noticed! However, did you know that displaying a sign can often require Council approval? A sign, or an ‘advertising device’, can take a variety of forms that you can observe every day on any city street. They are associated with a myriad of uses including businesses, garage sales, construction sites, clubs, events and home-based businesses and may be permanent or temporary, fixed or mobile. Depending on the type of sign proposed and local government, new signs may be assessed under the Council’s Local Laws, or as Operational Works development applications assessable against the planning scheme. While many signs require approval, the benefits they offer may outweigh the costs of obtaining approval. More information about different types of signage and approvals is provided below. Some signage may be exempt from assessment or is self-assessable, and may be permitted without local council approval depending on the type of sign, size and proposed location. Typically, criteria are specific and prescriptive, and vary between local government areas. Where these criteria cannot be satisfied, approval from the local government is required. According to the type of sign proposed and location, regulations apply to characteristics such as height, width, area, form and luminosity. Regulations may also limit the proximity of certain types of signs on a building or frontage, or the cumulative area of a building façade occupied by signage. Not all types of signs are permitted in all locations, and restrictions may also apply to the amount of time certain signs may be displayed. In certain instances where signs necessitate building work, this may constitute a separate development component assessable under a planning scheme, including where involving heritage buildings. This may necessitate a development application or obtaining of a heritage exemption certificate. It is therefore important to investigate these matters to avoid committing a development offence or delay in actioning a signage approval. Certain signs are considered by local councils to be inappropriate in particular localities and cannot be displayed. These are prohibited and an application cannot be made for approval. Other signs are considered to be generally inappropriate due to characteristics such as locality, type, size or illumination / animation, however may be assessed by a local council on a case-by-case basis. If you have a permit for signage from a local council, it is important to be aware that there may be ongoing costs, including annual fees for licence renewal. A lapsed approval, or the display of signs that do not have a permit or do not comply with exempt signage criteria may attract local government penalties. Do you need more information? Do you want to enlarge or upgrade an existing sign to gain more exposure? Not sure if you need a signage permit, or need to transfer a licence? 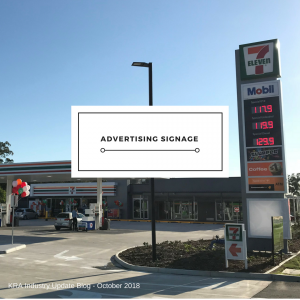 If you require assistance with any of these matters and want to maximise your advertising exposure opportunities, please contact Adrian from our office on (07) 3876 0533. Keep up to date with KRA! Check out our latest Instagram, Facebook, and Linkedin posts! Follow us here.